Tagged under Game of Thrones, Waifu, Short Hair, Blue Eyes, Blonde Hair. 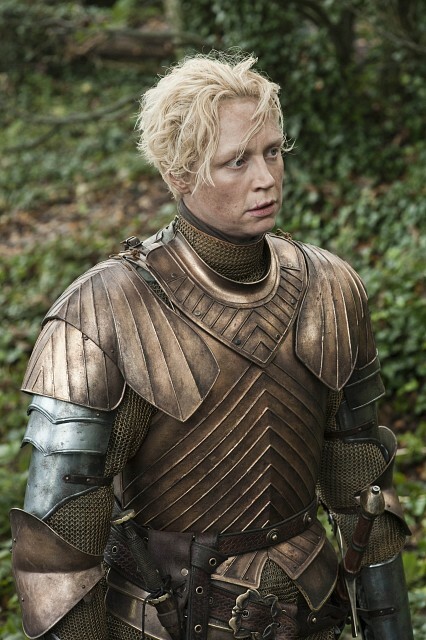 Brienne is the only surviving child of Lord Selwyn Tarth, whose House serves under House Baratheon. As a result of her tall stature and dressing mostly in masculine attire, Brienne is often criticized for being unladylike — even by the septa who raised her, undermining Brienne's self esteem. Despite this, she chose to become better in combat, even defeating one of her would-be suitors and restoring her confidence. Later on, Brienne meets and falls in love with Renly Baratheon, one of the few men who treat her respectfully; though her feelings aren't returned, she receives permission from her father to follow Renly in battle in the War of Five Kings. Soon after, she pledges fealty to Catelyn Stark and accompanies Jaime Lannister to King's Landing as part of an attempt to free the captive Sansa and Arya.